New Edwardian Period Painted Soft White Mantlepiece complete with period style cast iron arched insert suitable for solid fuel. 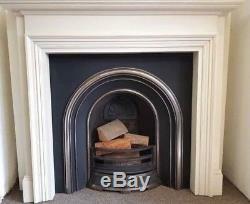 Lovely looking fireplace suitable for lounge or sitting room. We offer a "supply only" or "supply and fit" service within the Birmingham postcode areas. We have a traditional showroom and offer an unrivalled service with all of our engineers being either GAS SAFE or HETAS approved installers. Please send me your postcode for a quote , please note most local deliveries are completed within a week, courier deliveries are normally completed within 14 days. The item "Ex Showroom Arts and Craft Style Mantlepiece with Cast Iron Arched Insert" is in sale since Thursday, February 22, 2018. This item is in the category "Antiques\Architectural Antiques\Fireplaces, Mantels & Fireplace Accessories". The seller is "cottage_fireplaces" and is located in birmingham.